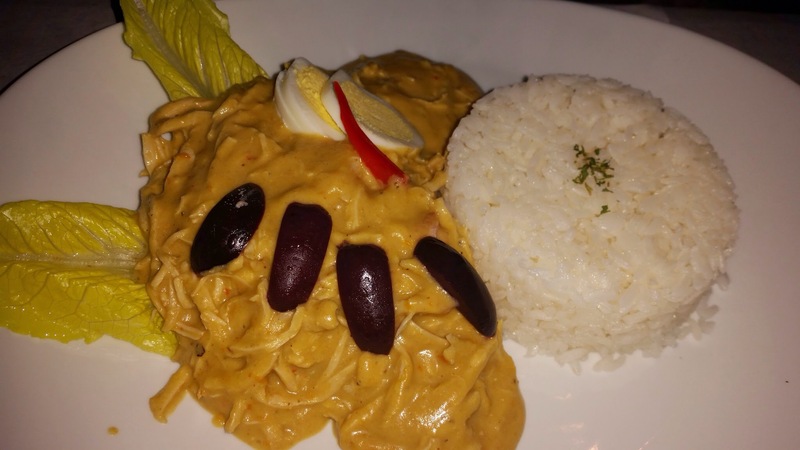 Quenas Restaurant is a Peruvian restaurant and was a result of an OpenTable research. When I walked up to it at 8pm on a random Tuesday night, there was only one table that was occupied out of a restaurant filled with at least 20 empty tables. I was ready to leave but since I was meeting someone there, I decided to flip a coin. I stayed and the verdict on the food was also like a coin flip – with a 50/50 chance of being good/terrible. 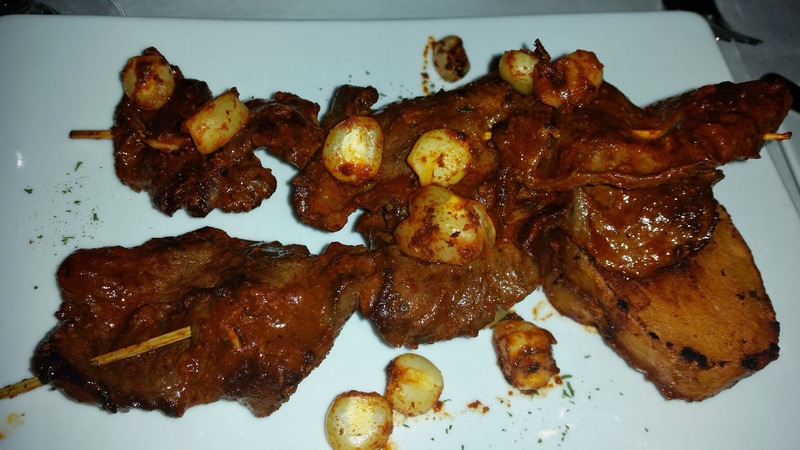 Anticucho: Delicious grilled beef heart kabob, served with grilled potatoes and Peruvian corn. You should all know me by now – if there is any gross or less main-stream items on the menu, I am your girl. This was a home run… the ball was so far out in the park. The heart was so much more tender than what you would expect with a nice resistance to the chew. The contrast of the dense potatoes against the crunch of the corn made a perfect marriage to the heart. This was excellent. Tallarin Saltado de Pollo: Spaghetti sauteed in soy sauce with chicken, onions, tomatoes and green peppers. When my friend ordered this dish, the first honest thought that crossed my head was – “That is a white guy, non-foodie choice. Good luck.” Amazingly when eaten with the olives, the chicken underneath all that ugly yellow sauce was really decent. But I still don’t get how soy sauce can be yellow. Soy sauce in Asia is always black or dark brown. Hmm. Is white man’s soy sauce yellow? 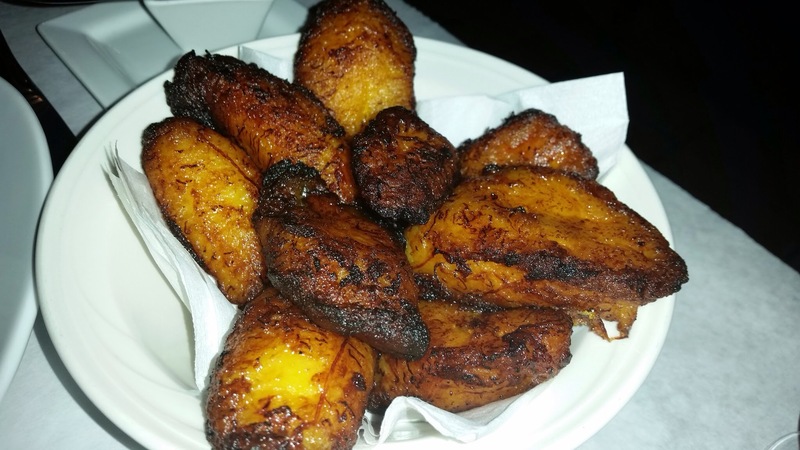 Plantanos Maduros: Fried sweet plantains. Nothing is wrong with the maduros. 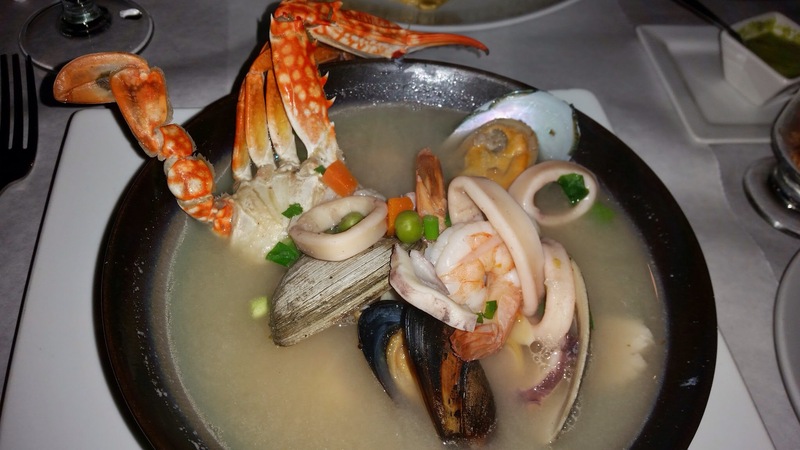 Parihuela: A delicious soup cooked with fish and mixed seafood, seasoned with Peruvian herbs. Because I was not hungry so I went for the soup. The friendly waiter told me that this is a famous Peruvian dish and is most authentic. You know what? Last I looked, both Peru and NY have access to the ocean and fresh seafood can be caught and transported to the restaurant on a daily basis. The seafood here was not fresh. It was a Tuesday, so Quenas, you have no excuse to serve me smelly seafood. I have a normal functioning nose and the seafood stink could be had before it got to me. Can’t imagine eating cerviche from this place. Flan: Egg custard with caramel. Best dish of the night. I love Latin American flan and they did it right here. It’s eggy and thick with heavy-yet-not-so-sweet caramel unlike those American versions. Loved it. 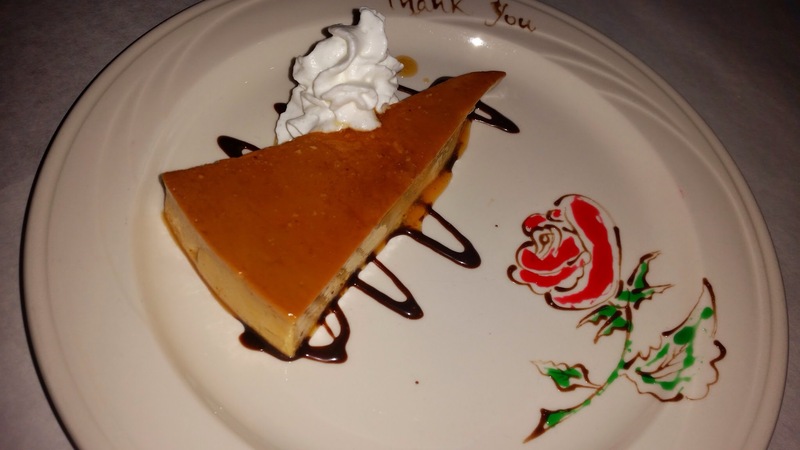 The wait staff was so attentive – see the “Thank You” on the plate in the photo above. I licked that up, by the way. Thanks to some of my closest business friends, I was at the Hive Living Room + Bar at the Renaissance Westchester Hotel for a wonderful, fun-filled evening. This was the first time I had ever been to the Renaissance and it exceeded expectations in both service and attention to details. I had a subsequent visit since then – read the review here. Now I will tell you why they exceeded my expectations for customer service. There were eight of us and five of us ordered steaks and asked for various temperatures. Unfortunately all the steaks were done a little too well from what we asked for. I was the first one to realize that my medium steak was in fact well done. So I started asking my colleagues whether their steaks were done correctly. As soon as we started checking our steaks and communicating, the chef ran out of the kitchen and wanted to know what was wrong. Once I explained that mine was well done vs. medium, he offered to re-fry my steak. He then went down the line and asked everyone who ordered steaks whether they wanted their steaks to be re-fried. Out of politeness and also because we were already half-way through our steaks, we all declined his generous gesture. The chef then offered free dessert platters as an apology. That was #GoodCustomerService! So even though our steaks were a little tough, we all felt happy at the end. And my friend, Wally, even wanted to order a steak as his dessert! Below is a quick recap of what we ate. 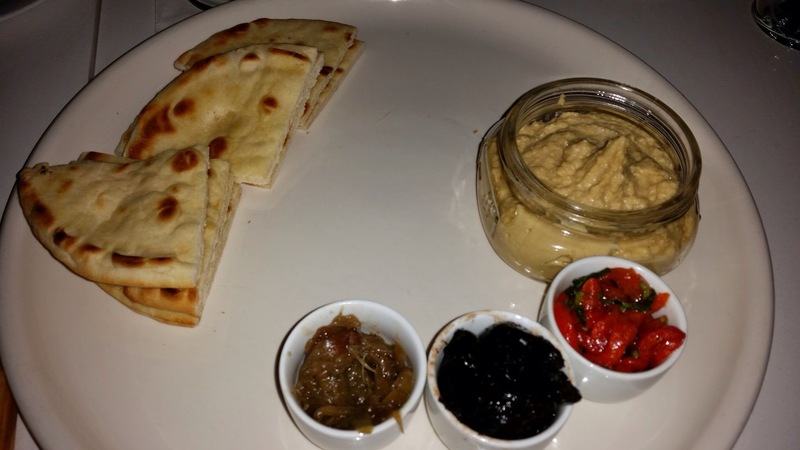 MEDITERRANEAN PLATTER: red pepper, kalamata olives, caramelized onion, roasted garlic hummus, and pita chips. This was average. 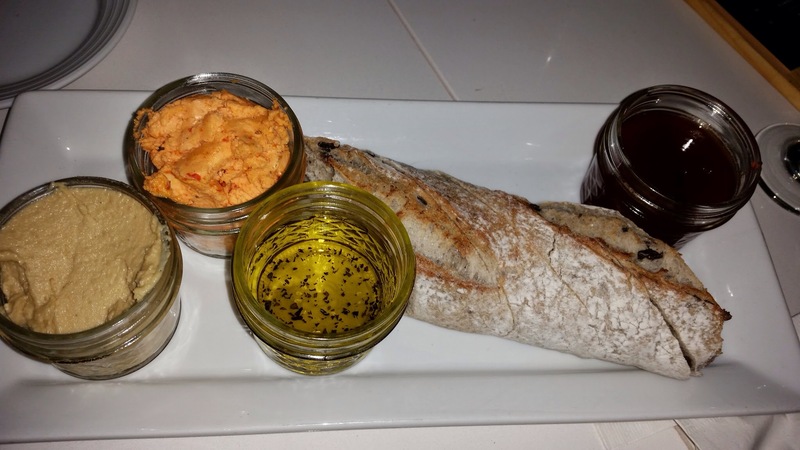 FRENCH BAGUETTE: with sundried tomato butter, herb olive oil, sriracha honey, hummus smears. The sriracha honey was very interesting; the combination works. 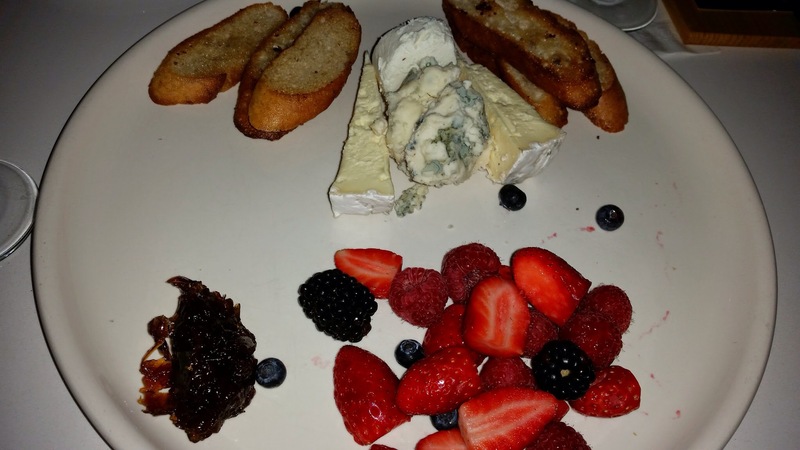 CHEESE PLATTER: soft goat cheese, Roquefort, brie, sweet onion jam, grilled baguette, seasonal berries. This was average. 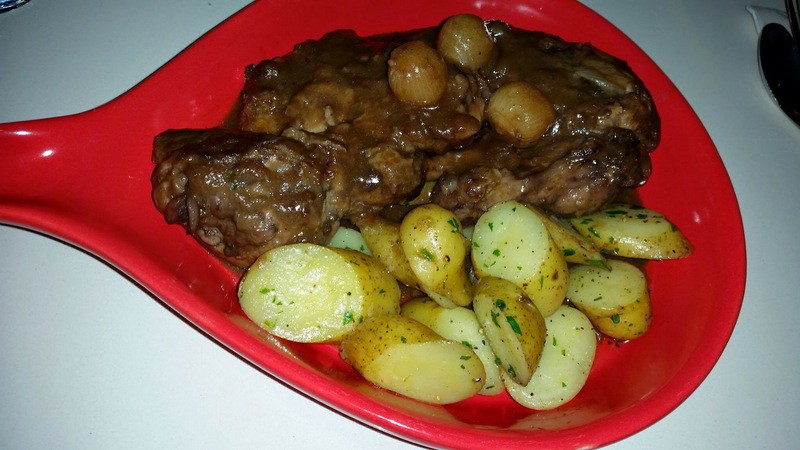 “Coq au Chiron” this is my mother’s recipe, at age of 11, when she opened her first restaurant near the city of Chinon, her popular dish was the coq au chinon, after school I was always in the kitchen and helped my mother cook. It was then I knew that I wanted to be a chef. We had no idea what the dish was from the description. My colleague, Mike, was brave enough to order it. Can you guess what protein it is? 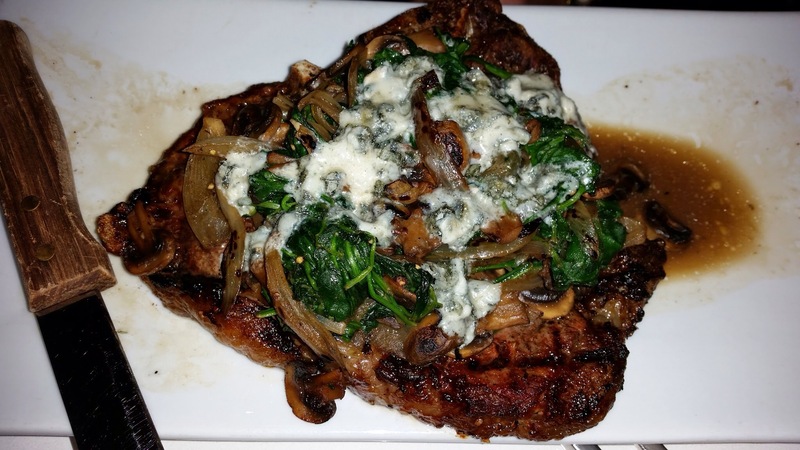 Special that night – a 9 oz steak! Way too big for the little woman (Danielle) who ordered it. The rest went to a beloved Rottweiler. 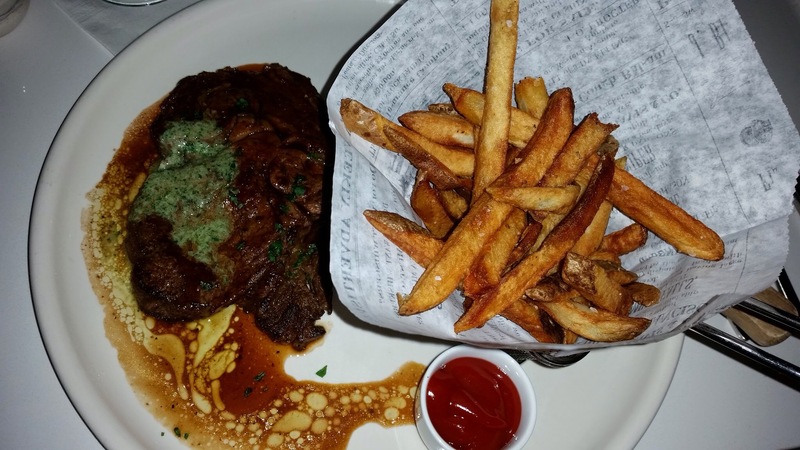 “STEAK FRITE” seared rib-eye, home-made french fries, maitre d’ butter. Pretty good. Just wish it were medium versus well done for me. For people who ordered medium rare, their steaks were medium. Darn! The fries were good. 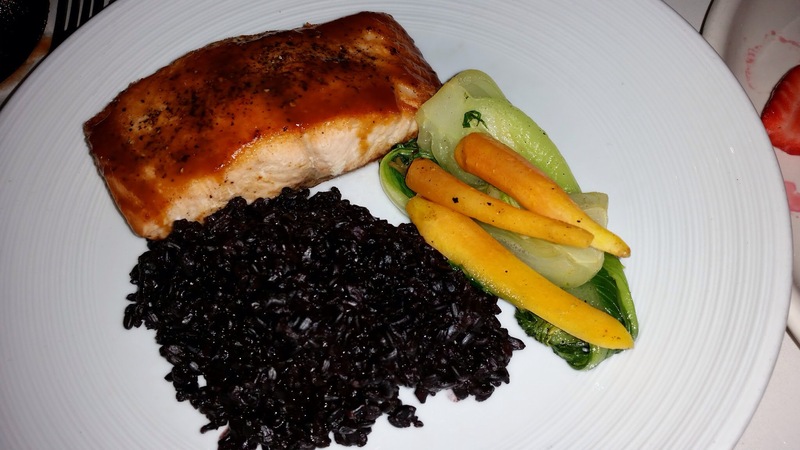 MISO GLAZED SALMON: steamed baby carrots and bok-choy, forbidden rice. Very respectable. The forbidden rice was a nice touch. The color scheme (dark pink, green, orange and black) was very pleasing to the eye. Interesting though – they did not ask whether the salmon was cooked to our liking. This is the dessert platter the chef put together for us. 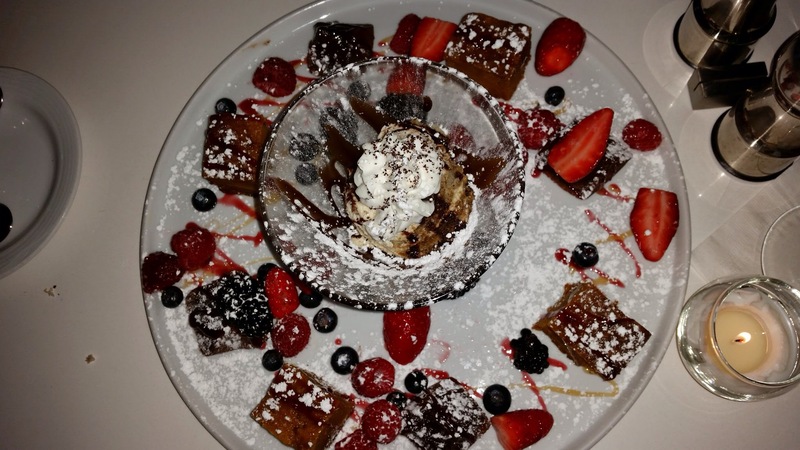 It included: WARM CHOCOLATE LAVA CAKE, CLASSIC TIRAMISU, spiced pumpkin bread and mixed berries. The aspect of a complimentary dessert is nice but the desserts were just ok. Overall, you cannot go wrong because of their service and how much they want to please the customers. The wait staff were very keen to meet our every need and paid very close attention to every little detail. It made a great evening with friends. Hive Living Room + Bar at the Renaissance Westchester Hotel probably does not get the recognition it deserves because no one ever goes to a hotel restaurant unless you are stuck at the hotel or at a conference at the hotel. In all fairness, Hive Living Room + Bar has interesting menus; the food is pretty good; the atmosphere is intimate and cozy; and the staff is attentive – all the hallmarks of a good restaurant. The only con is that it is located in a weird place (off I-287 at the end of a corporate road) and no one ever thinks of going there. I am going to try to convince the readers to visit this restaurant because it will be worth the effort. This is my second visit to the Hive Living Room. The first time I went with a large group of people for business and ordered a long list of items from their menu. The review on that will be coming up shortly. Today’s post is focused only on burgers and the panna cotta. 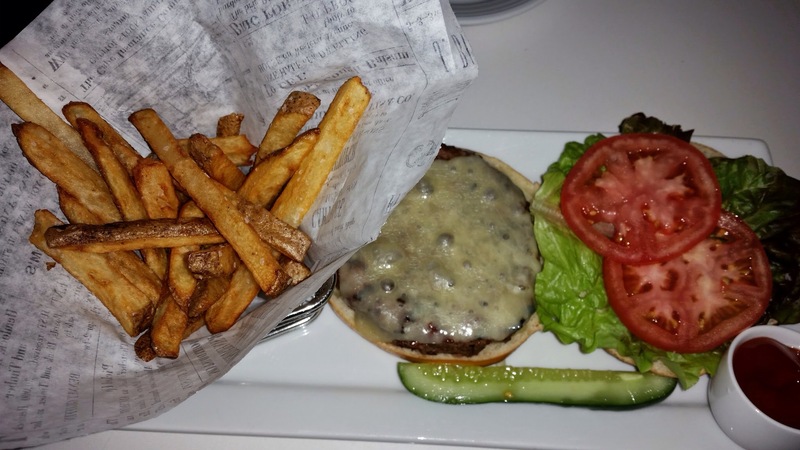 CLASSIC ANGUS BURGER: aged cheddar cheese, tomato, lettuce, on toasted brioche. The chef makes a good burger. The temp was correct on the burger; the meat was good. The fries were also good and crispy. I would totally come here again for the burger. Do you know why? Because the burgers here are as good as any famous burger place and the cozy atmosphere and the business crowd elevate the experience. It has a much more sophisticated vibe and is less busy. “ R” ANGUS BURGER: fried egg, onion, bacon, tomato, lettuce, on toasted brioche. The friend who had this dish told me that “A fried egg is good on top of anything.” I love my fried eggs for breakfast. 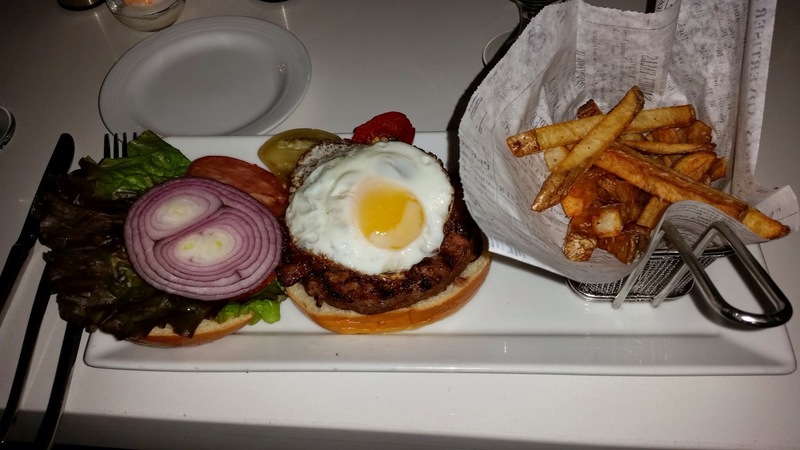 So how can I resist a fried egg on top of a good burger? Just in case you have any doubt, this is a good one. MIXED BERRY PANNA COTTA. I loved this panna cotta for its jiggly texture and not too sweet nature. Adding the fresh berries, it was the perfect dessert for me for the night. Could not have ended on a much higher note. It was also the perfect dessert for sharing. It is never messy. A note for the readers: the restaurant has a very nice bar, many high tables, and comfortable high back sofas and chairs. It has a living room feel and makes you want to sit in any one of those chairs. Just relax into the cushions and disappear. Release all the stress and let go. Don’t you want to eat at the Hive Living Room + Bar now? My friend Lisa and I usually go to Trattoria Vivolo when she meets me at work for lunch. 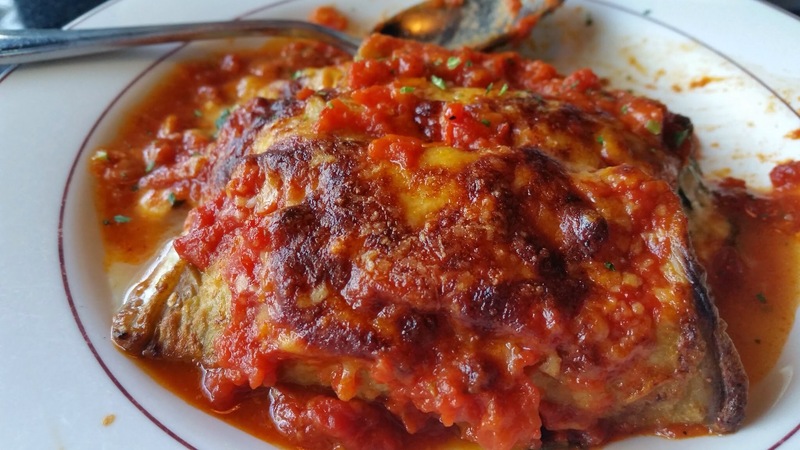 Trattoria is a fine Italian restaurant by the Harrison Metro North train station. Lisa is a friend of the owner and each time we are there, two glasses of wine are always waiting for us. Today was such a special day that I drank! Back to the food. The food has always been excellent and consistent. It’s down to earth Italian food. Fresh, simple and satisfies. Trattoria Vivolo takes away the need to home cook Italian. 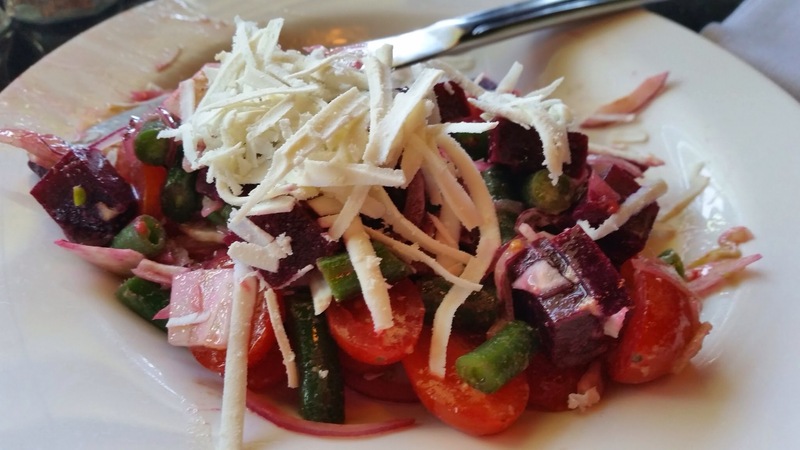 This is the beet salad, with almond chips, green beans, cherry tomatoes, onions and mozzarella cheese. It was so good that both Lisa and I wanted to recreate it at home. Here is the spinach wrapped in eggplant. Much much better than how it may look. 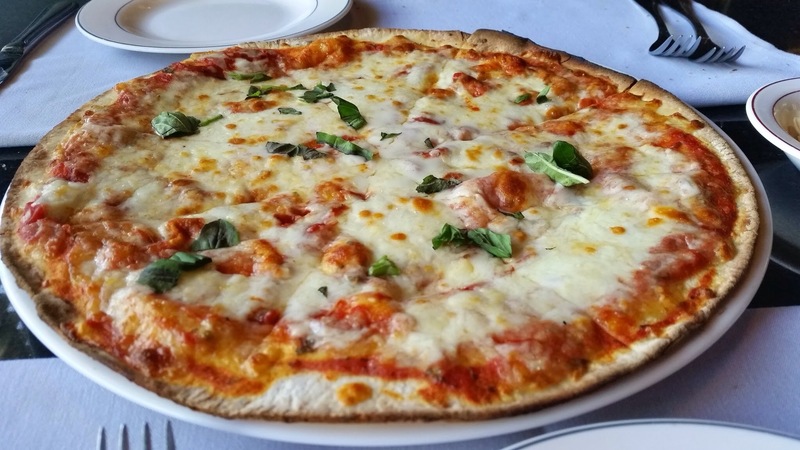 And we concluded the meal with a always cheesy and thin Pizza Margherita. Cheers to a happy and content life! 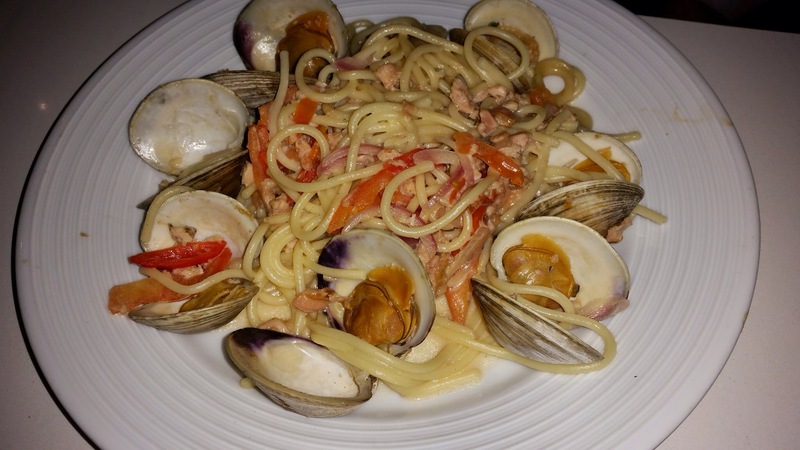 Let’s embrace life with the same freshness and simplicity Trattoria Vicolo demonstrated. Salute!